Join us on this hike through the valley of waterfalls - Utladalen. The valley of Utladalen is part of the Utladalen Landscape Protection Area, and known for its epic scenery. 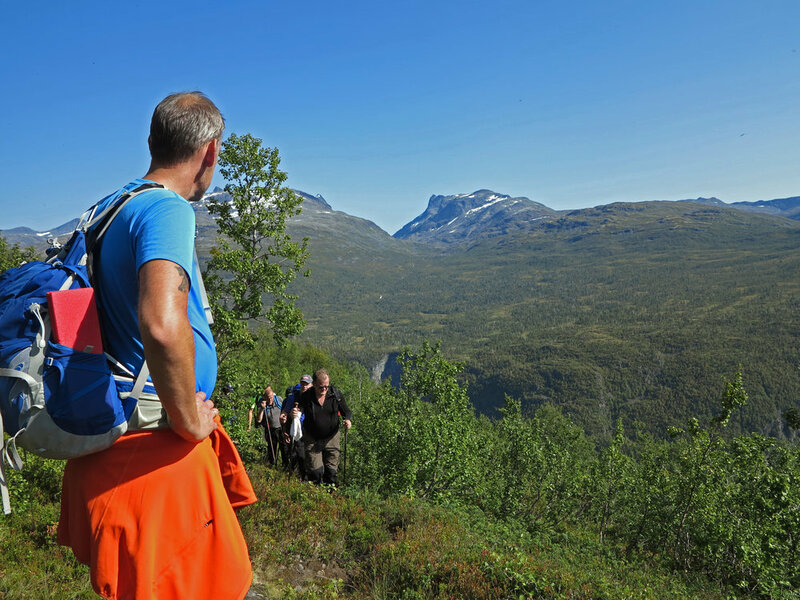 Our local guides will tell you about the history of Utladalen, both cultural and natural. We will stop by the exhibition in Utladalen Naturhus, hike along the river Utla and you get to see a minimum of four big waterfalls - with Vettisfossen waterfall at the end. booking not available online, please get in touch. We offer day trips in Jotunheimen Nationalpark. Let our guides suggest a suitable hike for you - and get going. There are several amazing viewpoints surrounding Årdal - and you get to choose which one you want to hike to. Get in touch to discuss the details and we will tailor a hike with a view for you. We offer helping you with your luggage if you are hiking in the valley of Utladalen. Our horse will carry your stuff from the parking at Hjelle to Vetti Farm Touriststation. Suitable for families who want to stay the night at Vetti Farm, and the children love hiking together with the horse.